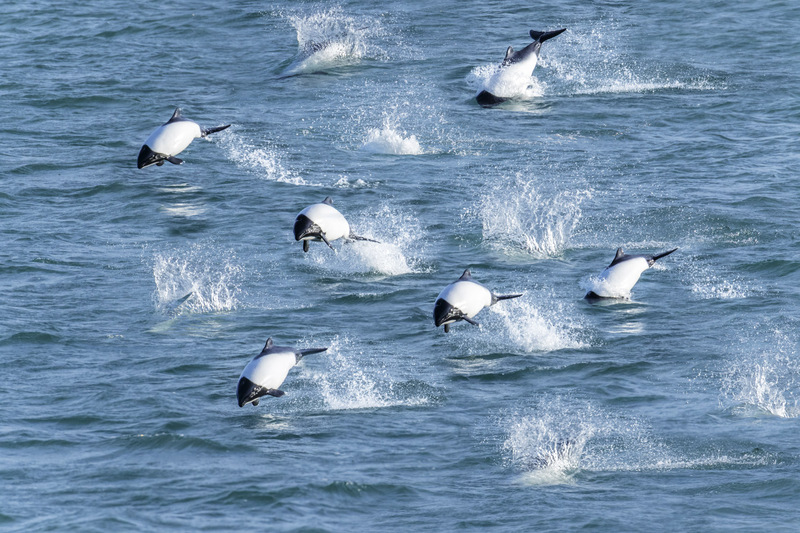 Also known as the Panda dolphin, Commerson's dolphin (Cephalorhynchus commersonii) has a very distinctive patterning. It has a black head, dorsal fin, and fluke, with a white throat and body. The demarcation between the two colours is very clear-cut. This stocky creature is one of the smallest of all cetaceans growing to around 1.5 m (5 ft). The larger population is found inshore in various inlets in Argentina, in the Strait of Magellan and near the Falkland Islands. This is a composite using three different dolphins.